Demonstrators gather near the studio of singer R. Kelly to call for a boycott of his music after allegations of sexual abuse against young girls were raised on the highly-rated Lifetime mini-series ‘Surviving R. Kelly’ on January 9, 2019 in Chicago, Illinois. Prosecutors in Illinois and Georgia have opened investigations into allegations made against the singer, whose real name is Robert Sylvester Kelly. The plane has been commissioned by national women’s organization UltraViolet. The women’s group is calling out the record companies for their continued relationships with and enabling R. Kelly, despite decades of sexual abuse allegations; allegations that have become even more vivid in the aftermath of the deeply disturbing documentary series Surviving R. Kelly on Lifetime. 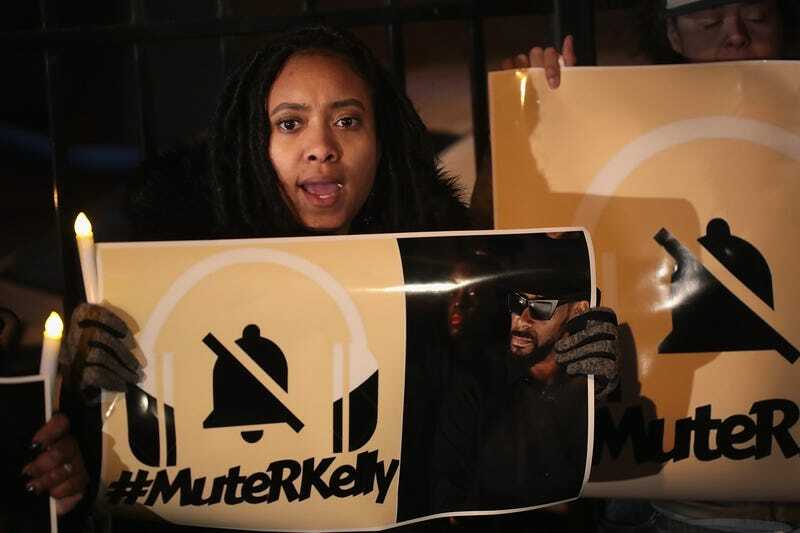 The organization credits the leadership of #MuteRKelly campaign co-founders Kenyette Barnes and Oronike Odeleye, who worked with executive producer dream hampton on the documentary. The campaign, which has been successful in convincing several concert venues and radio stations to disassociate with the entertainer, continues to protest any support of Kelly’s ongoing career, including the continuation of his record contracts. In addition, UltraViolet has issued a petition urging RCA to drop R. Kelly, with signatures numbering in the tens of thousands. Roland also called out popular streaming platform Spotify, which was among the first to remove R. Kelly from its playlists last year, garnering an open letter of thanks from UltraViolet. Sadly, the service soon reversed its decision due to pressure from industry heavyweights like Kendrick Lamar, who threatened to pull his own catalog from the service in support of Kelly. #MuteRKelly co-founder Odeleye has had plenty to say as well, publishing an op-ed in Glamour on Tuesday about her own awakening to the accusations against Kelly, the founding of the countermovement, and the backlash they have faced, predominantly from within the black community. In black communities, I think when people heard about #MeToo, the reaction was, “Yes!” When we heard about Time’s Up, it was, “Yes!” When people heard about #MuteRKelly, it was like, “Hold on now…” His music is so rooted in our experience that we have an emotional connection to it—not so much to him, but to the music itself. When people hear “Step In The Name Of Love,” it brings up good memories. When they hear “I Believe I Can Fly,” they’re not thinking about Space Jam, they’re thinking about their baby’s graduation from kindergarten. It’s not OK, but I do think a lot of people didn’t want to let those good feelings go and face the reality that was behind them. As black people, we have an inside voice and an outside voice. We’re cautious when it comes to criticizing other black people in the media. We feel and often attacked from all sides. People don’t want to contribute to that. Sometimes we can’t parse out when an attack is relevant and when it’s not—who we should support and who we shouldn’t. Part of the problem also is that as a culture in general we worship celebrities. We want to be like them. Eat what they eat. Wear what they wear. It’s hard to accept that sometimes, yes, someone is a terrible person. And our support has helped him this whole time. Recognizing the rise of the #MeToo and Time’s Up movements in tandem with #MuteRKelly, Odeleye also draws the correlation between the three, writing that they “focus on different aspects of sexual abuse,” but share a common goal. The Glow Up tip: Los Angeles area residents, the UltraViolet protest is taking place today, Friday, Jan. 11 from 11:00 a.m. – 1:00 p.m. PST at the Sony Music Offices. 10202 Washington Blvd, Culver City, Calif. 90232.